On November 19, 2014, Fraunhofer Center for Sustainable Energy Systems CSE successfully installed and commissioned their Plug and Play Photovoltaic (PV) System in front of a public audience for the first time. Held at Massachusetts Clean Energy Center’s Wind Technology Testing Center in Charlestown, MA, the Plug & Play PV demonstration brought together representatives from the clean energy industry, utilities, local jurisdictions and academia to experience a complete system installation, including commissioning, in about one hour. 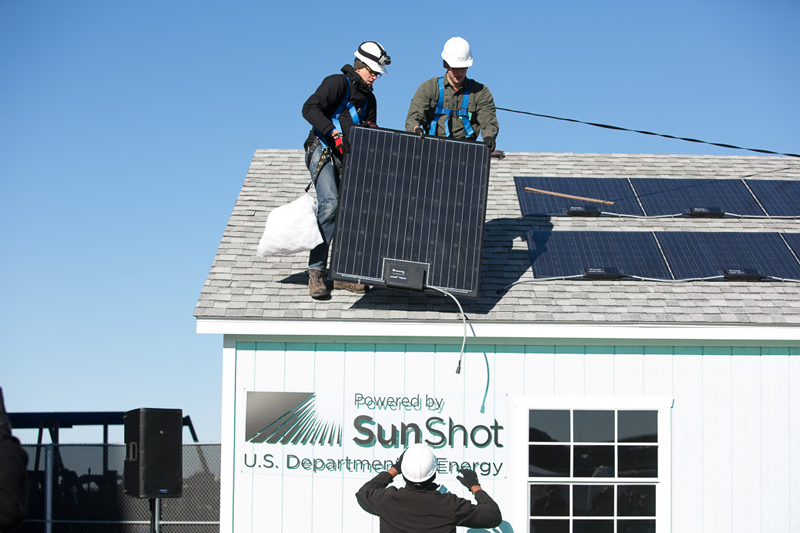 Funded by the U.S. Department of Energy (DOE) SunShot Initiative, the Plug and Play PV System approach revolutionizes the ease of installation, while improving safety during installation and operation. Once commercially available, homeowners will be able to purchase a PV system at their local home improvement store, and install it in less than 10 hours – as easily as installing a washer / dryer combination. The speed of installation and the automated permitting, inspection and utility interconnection processes designed into the system will drive the cost of an installed PV system from today’s cost of over $4/W down to $1.50/W in 2020. This will enable the widespread adoption of solar for residential rooftops. Prior to the demonstration, guests heard from the Commonwealth of Massachusetts Undersecretary for Energy and Environment, Mark Sylvia; City of Boston Director of Energy Policy and Programs, Bradford Swing; National Grid Director of Customer Strategy and Environmental, Carol White; Northeast Utilities Senior VP and Chief Customer Officer, Penni Conner; and DOE SunShot Initiative Tech to Market Team Manager, Lidija Sekaric, who all spoke on the importance of investing in solar and innovative technologies. “National grid recognizes that sustainability is really critical to a bright future here in the Commonwealth,” said White. Northeast Utilities’ Conner also commented on the importance of connecting consumers with innovative products. “We are committed to helping our customers towards a sustainable energy future,” said Conner. Following the remarks, guests were guided through the complete Plug and Play PV System installation and commissioning in one hour and fifteen minutes. CSE Center Director Christian Hoepfner and CSE Engineering Program Manager Jacqueline Ashmore narrated the process step-by-step, starting with the installation of lightweight PV modules on the rooftop, with adhesives rather than with a metal racking system. All wiring was accomplished with prefabricated cables and touch-safe connectors, making it completely safe for someone without specialized skills to perform the installation. Once the system was fully installed, guests experienced first the system’s self test process and then the system commissioning from three different perspectives (homeowner, jurisdiction, and utility). Fouad Dagher, Director of Emerging Technologies and Products at National Grid, represented the utility giving permission to interconnect through an online utility interface. After this step, the installation team activated the system to generate power. “This is going to make a difference in the consumer market. It is going to make customers want to install solar faster. Seeing how quick the installation went up, I would say customers are going to love this system, inspectors are going to love this system, and the utilities will be very glad to be working with the customers and the inspectors and the community on integrating more renewable energy to the distribution system,” said Dagher. The next steps for the Plug and Play PV Systems project will focus on the demonstration of a commercial-ready system in 2015.